We invited Paleo Mom & Dad over for dinner to celebrate Father’s Day last Sunday. And while the Seattle weather wasn’t exactly screaming for a BBQ, I decided upon a BBQ menu anyway. I was just itching to try something new, and I had remembered that Bill the Butcher had something called “Bacontastic” that I had wanted to try – basically, ground beef mixed with chunks of bacon for making burgers. Mmm. Bacon. Bill the Butcher has a fantastic and wide selection of grass-fed beef, but they also have some selections that are grass-fed and then 30-day corn-finished, and some that are just “natural,” so we always double-check our order just to make sure we’re avoiding any corn-fed beef. It turned out that the Bacontastic I had set my heart on was one of those grass-fed/corn finished selections. Disappointed, I wasn’t sure what to do next. I already had this menu idea planned and really had my heart set on these burgers. Lucky for us, Scott at the Redmond location always takes great care of us at Bill the Butcher. (And no, he doesn’t pay us in free meat to write these nice things. But I wouldn’t complain if he did.) 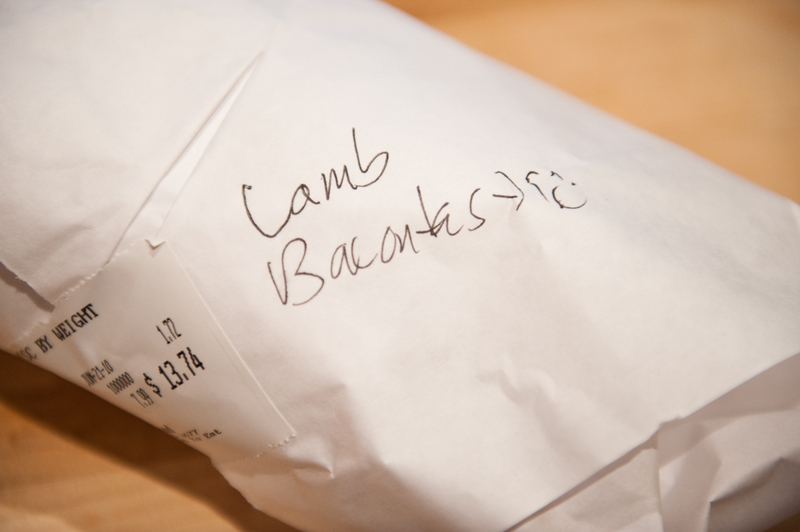 He recommended we use the ground lamb meat, and offered to mix the bacon in with it for us, thus creating our very own Lamb Bacontastic, 100% grass-fed. I knew my parents loved lamb, so I was super excited to try this. 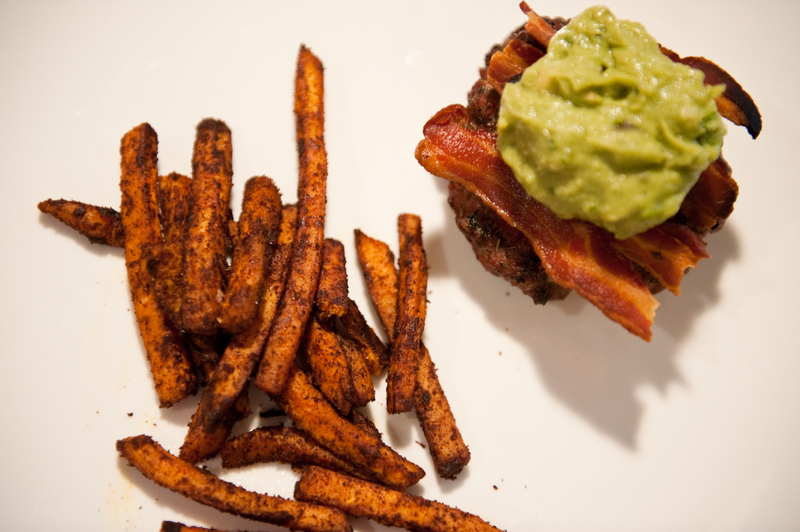 We found this recipe for the Sweet Potato Fries on the Everyday Paleo site. She’s got some fantastic recipes there! Add bacon, parsley, oregano, sea salt, and black pepper to the ground lamb. Mix by hand until all herbs are evenly distributed. 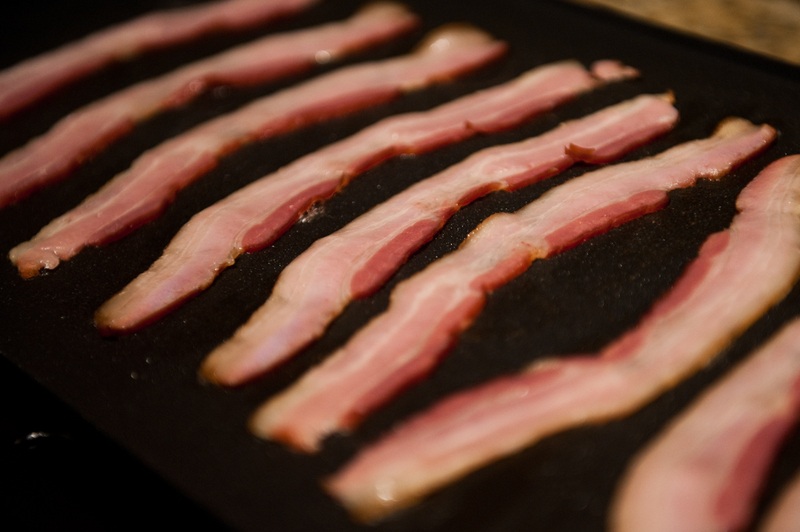 While the burgers are grilling, cook up a few more pieces of fresh bacon! 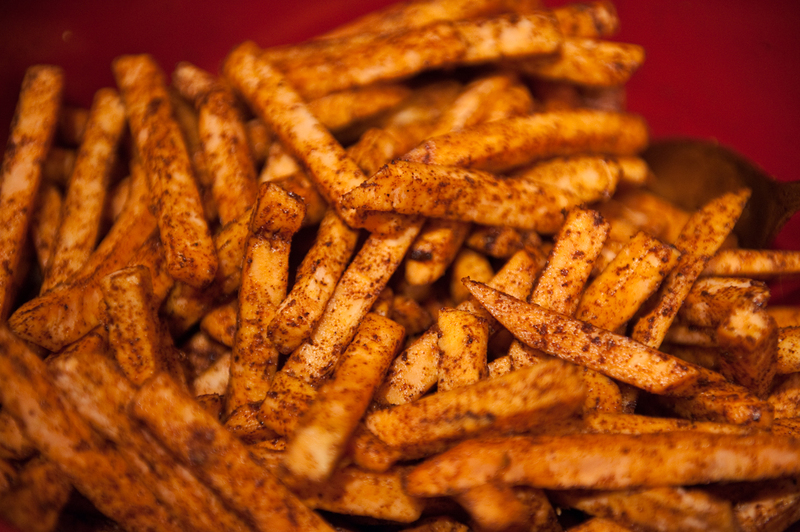 NOTE: These fries are pretty darn spicy. 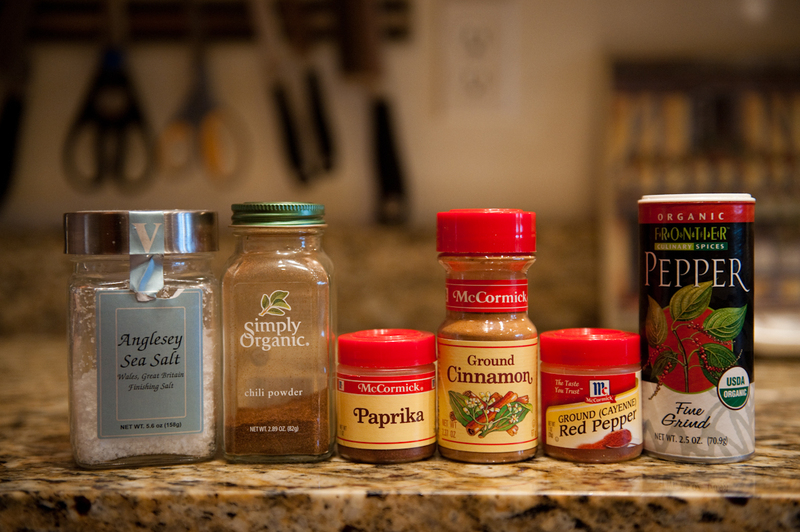 If you don’t like a lot of heat, modify the spices to your preference! 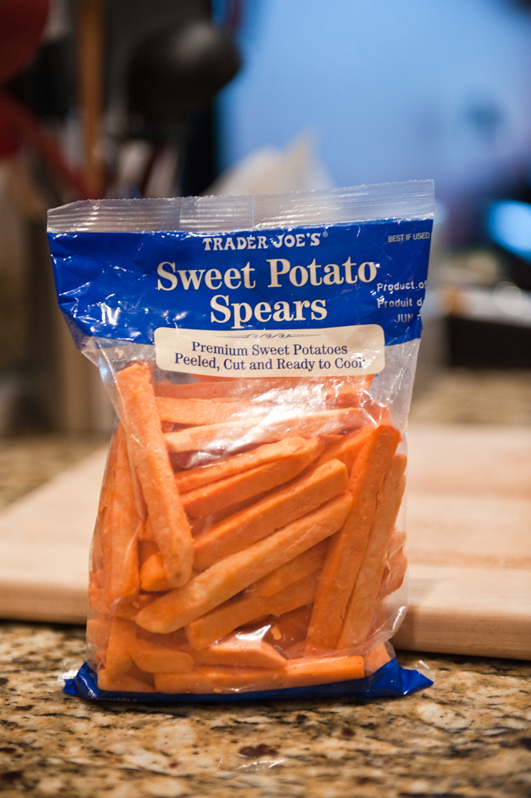 In a large bowl, whisk all spices together with the olive oil and then toss the sweet potato spears in the olive oil mixture until all the spears are coated. Line a cookie sheet with tin foil and evenly spread the potato spears on the foil. Bake for 20 minutes, turning the spears over half way through the cooking time. Fries will be soft when done. 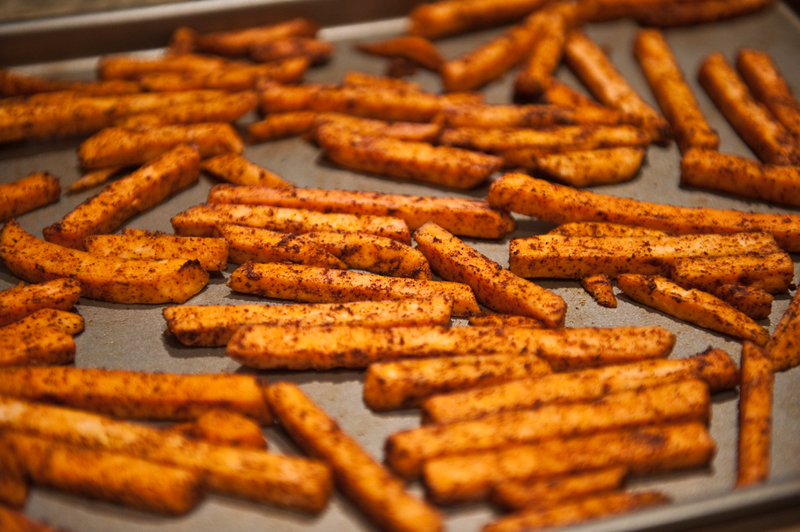 For a crunchy fry, try frying them in coconut oil! One HOT combination of spices! Trader Joe’s makes it so easy! 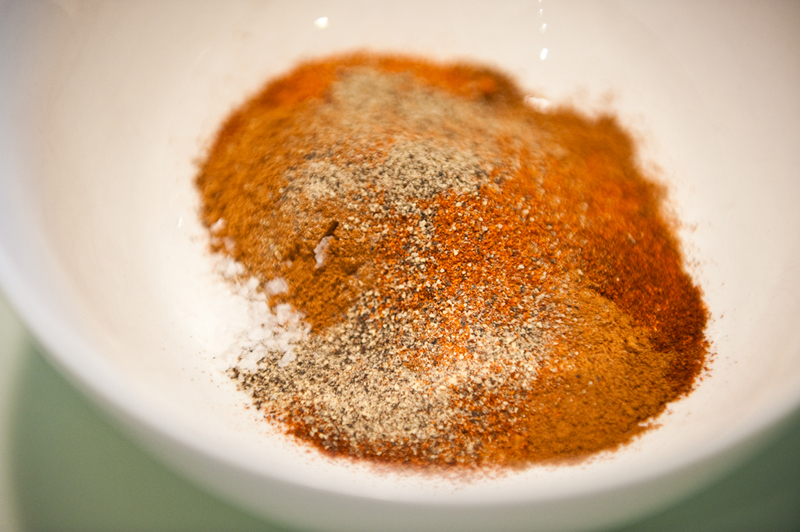 Mix olive oil, spice mixture, and spears until well-coated. Spread on a baking sheet (we used two sheets to give the spears some room). At halfway done, they pretty much look the same. Flip & continue baking. I think the final dish makes a lovely presentation! There is so much color and flavor in this meal – a great one for guests! 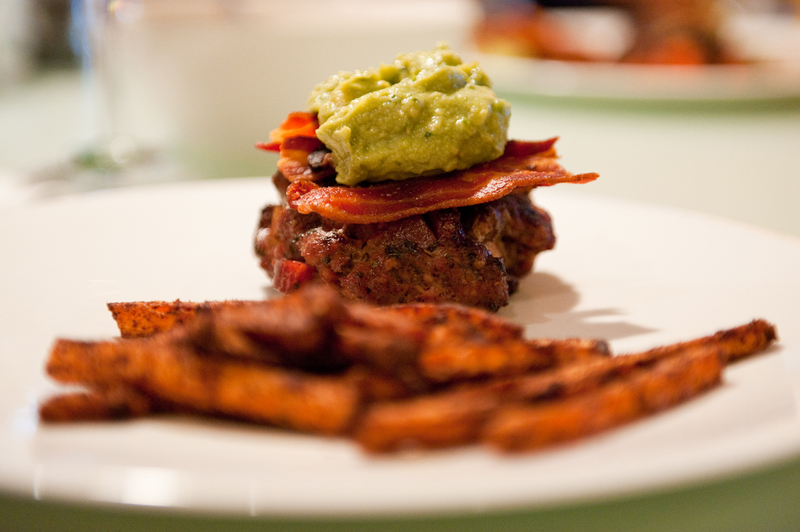 CLICK HERE FOR A PRINTABLE RECIPE FOR LAMB BACON BURGERS! 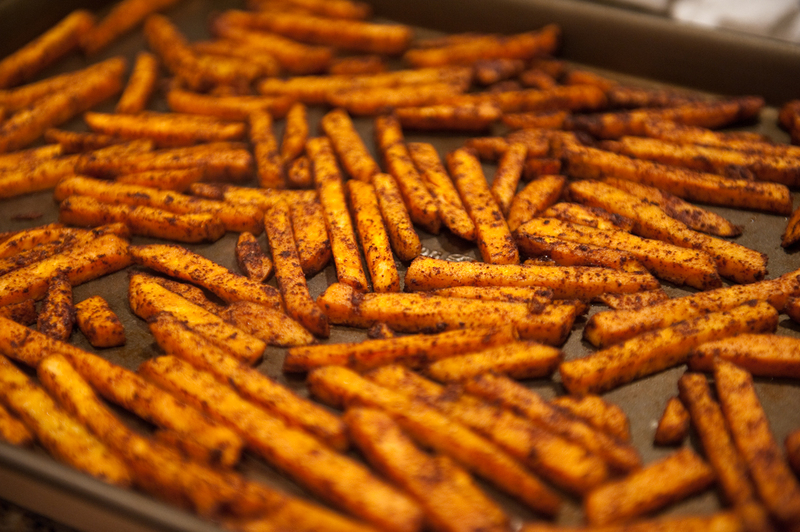 CLICK HERE FOR A PRINTABLE RECIPE FOR SWEET POTATO FRIES! 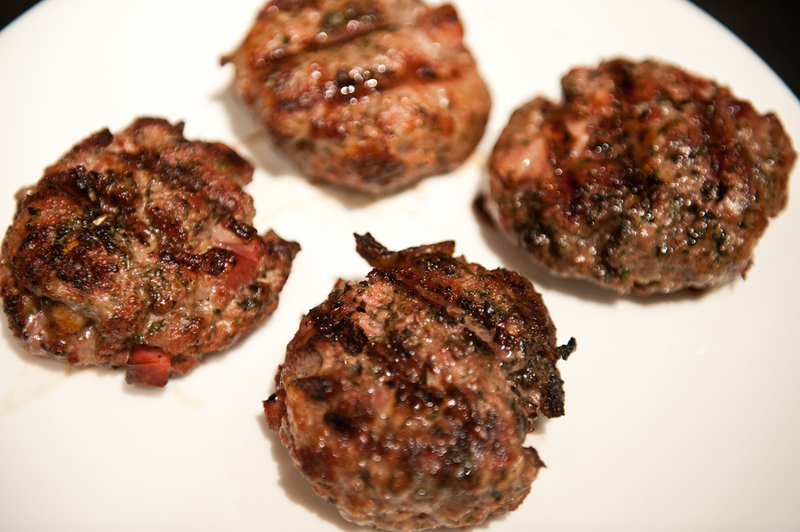 I made lamb burgers a few nights ago…love them!!! 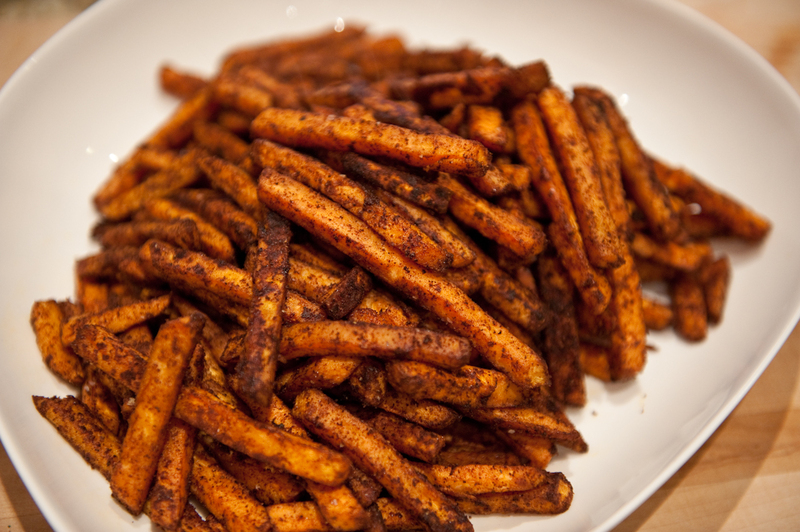 And, these yam fries look delicious, but quit it already with the Trader Joes comments…we moved to Texas four years ago and only get to stock up during our visits to Oregon and California…so jealous! By the way…I discovered this Lucini Dark Cherry Balsamic Vinegar at our Whole Foods and thought you might appreciate it! It is awesome! 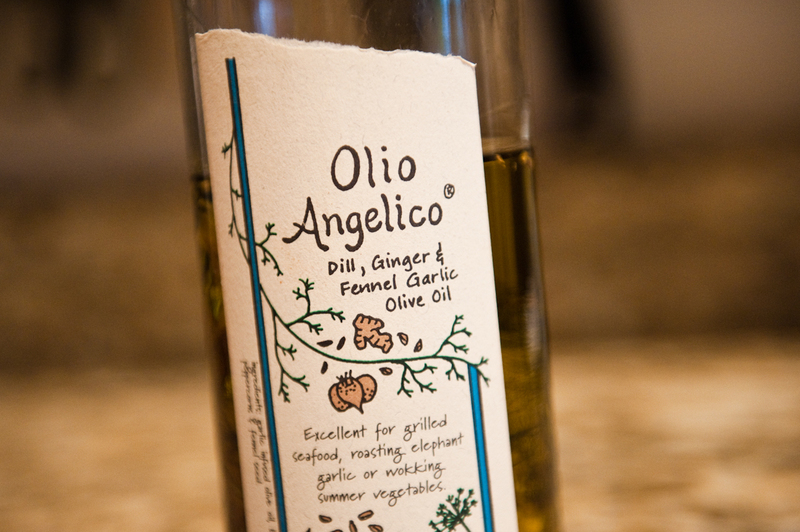 We love that olive oil too!! We went to the market and came home with 3 bottles of it. Have you tried their lemon galric one?? Its wonderful too. 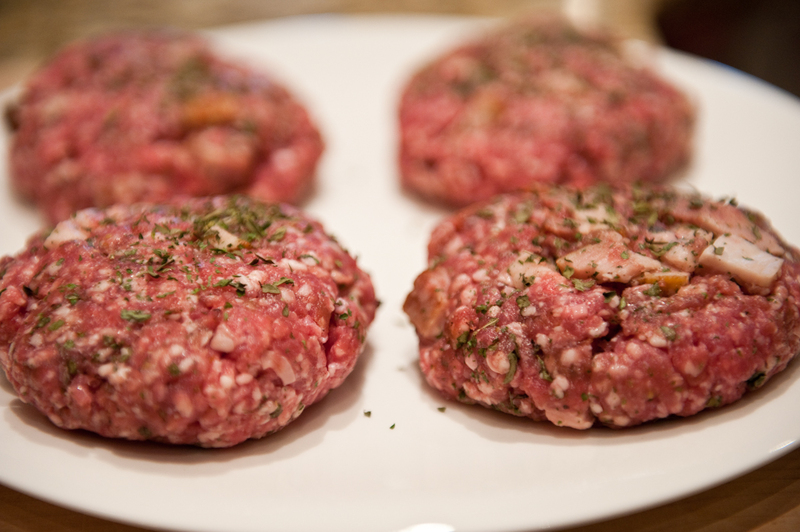 Going to give these lamb burgers a try this weekend. Thanks Joey! Hey Melissa! I think we sampled them all at one time, and I was buying the spicy one once in awhile too, but we just stuck with the Angelico because we found we liked it all across the board on everything. The lemon garlic sounds delicious! Any idea how much bacon you’d add to the meat? Could I substitute other meats such as beef, turkey, or chicken just as easily? btw your photos are gorgeous – very inspiring stuff! Hi Joey! I’ve been checking out your recent wedding and engagement shots, they are gorgeous! I can tell you’ve been really busy. Just wanted to say hello and I hope everything is going well. These burgers look delicious, as well as everything else on your site. I love your website. Great recipes that are easy to follow and great photography. Keep it up, you’re making me a better cook haha. I’d check your links for bill the butcher, the website you link to now….well, it doesn’t look anything like a butcher shop, in fact, I’m not even sure that site is safe to visit without up to date browsers and AV software. Thank you Chadd! That was their old domain address, I went ahead and updated it – thank you so much for the info!